Conferences and events worth more than £1m were brought to Bath by The Apex City of Bath Hotel in 2018 – its first full year of trading. The 177-bedroom hotel on James Street West opened in August 2017. 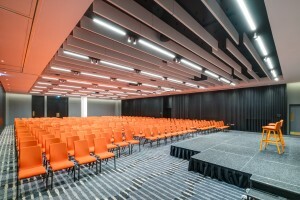 The £50m property is the Bath’s largest hotel and only purpose-built city centre conference venue with a 400-delegate capacity. Figures released this week by the Apex Hotel group show that the Bath hotel staged 677 conferences and events, including 400 attendees for the British International Studies Association’s annual four-day conference. Aside from conferences and events, room figures for the hotel equate to £6m and 48,000 room nights over the 12 months. The hotel has eight meeting spaces that can cater for a wide range of events from flagship company conferences to private weddings. The hotel’s group meetings incentives conference and events sales manager Phil Bailey said: “We’ve had an exceptional 2018 where conference and events is concerned, having built on an already successful debut, we have now cemented ourselves as the premier location for conference and events of all sizes in the city of Bath. “In attracting both domestic and international business into city, we have helped lift tourism figures and give a vital boost to the local economy. Among the strong stable of clients built up by the hotels team is conference and events specialist KC Jones, which has used the hotel’s state-of-the-art facilities across its client portfolio on numerous occasions. KC Jones event manager Tammy Pratt said: “The Apex City of Bath is a perfect juxtaposition of a modern hotel sympathetically presented in the centre of Bath, providing a much-needed large-scale conference venue in the city. The Edinburgh-headquartered Apex Hotels group operators 10 four-star hotels – four in Edinburgh, three in London and one each in Glasgow, Dundee and Bath.